2nd & 4th Wed. at 6:30 P.M. 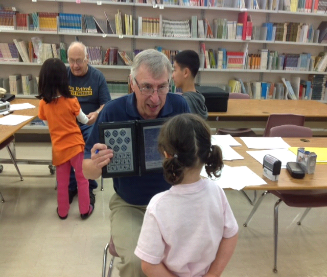 The Royal City Lions Club along with the Guelph Lions Club and the Fergus Lions Club participate in the Lions Vision Screening Program and offer vision testing to every kindergarten student in schools from the Upper Grand and Wellington County Catholic School Boards in the Guelph and Fergus area. This year the clubs will test about 3000 students, with the Royal City Lions screening about 1200 of the students. Our vision team, consisting of 6 regular members and 4 alternatives, is very proud of this program and will collectively volunteer about 300 hours. 1. Visual Acuity: This test determines the ability of a child to identify symbols on the 20/30 line of a vision chart from a distance of 10 feet, with each eye. 2. Auto Refractor: This machine provides a preliminary measurement of the child's prescription to see if their vision is within normal for their age. This will also allow us to determine if one eye may possibly be weaker than the other eye in vision. 3. Stereo Acuity: While wearing 3-D glasses the student’s ability to identify 3-D images from a sample book is determined. This will give us an indication of how well the eyes are working together. On completion of the screening, a recommendation is made to the parents/guardians of any student who does not meet the minimum criteria for the above tests to seek the professional help of an optometrist for their child. Additionally, the Parents/Guardians of students who have passed the three tests are encouraged to have their children seen by an optometrist within 6 months. They are reminded that the cost of these examinations is covered by OHIP. They are also advised the Royal City Lions are ready to help with the cost of glasses, should they be a financial burden for the family.